Liszt's father, as a music lover played the piano, the violin, the cello and the guitar. At the age of six, Franz Liszt began to listen attentively to his father playing the piano, while showing interest in sacred music and Romani music. Adam knew the musical ability of his son and at the age of seven he taught his first piano class. 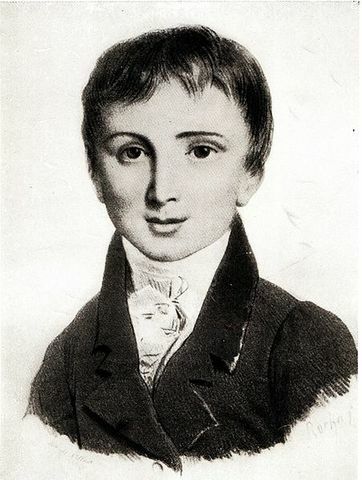 Franz began to compose in an elementary way when he was eight years old, in 1819. That same year he made his first performance as a pianist. His public debut, after having learned from great composers such as Karl Czerny and Antonio Sallieri took place in Vienna, in a concert at the Landständischer Saal, which was a great success. He was received in the aristocratic circles of Austria and Hungary and also met with Beethoven and Schubert. Towards the end of 1823, he published his first composition, a Variation on a Diabelli waltz. Finally, on December 11, 1823, the family arrived in Paris. The next day, his father took him to a conservatory to learn. Being rejected for not being a French citizen, his father decides to become his teacher. From 1824, Liszt studied composition with Anton Reicha and Ferdinando Paër. He made several concerts, sonatas, among other things. he composed several concerts, sonatas, works of chamber music and many other works. He began to compose an opera, Don Sanche, or Le château de l'amour. He began to lose interest in music and spent a lot of time with religious ideas. However, he was forced by his father to continue giving concerts. In the summer of 1827, Liszt fell ill. Adam Liszt went with his son to Boulogne-sur-Mer. While Frank was recovering, his father fell ill with typhus and died on August 28 of that same year. He was buried in Boulogne and Franz never visited his grave. With the death of his father, Liszt's concert career as a child prodigy ended. Although he had earned a lot of money and a prominent name, he had not had the opportunity to develop his education in general.He filled this gap through intense reading. He composed practically nothing in those years. The Revolution of July 1830 inspired him to sketch a revolutionary symphony based on the events of those "three glorious days." He met Hector Berlioz on December 4, 1830, the day after the premiere of the Fantastic Symphony. Berlioz's music made a strong impression on him, especially afterwards, when he wrote compositions for orchestra. He also inherited from Berlioz the "diabolical" quality of many of his works. After attending a concert by Niccolò Paganini in 1832 for the benefit of the victims of the cholera epidemic in Paris, Liszt made the decision to become a great virtuoso of the piano, as was Paganini on the violin. Liszt's strength and ability to stand out was in the domain of all aspects of piano technique. He spent years studying the possibilities of the piano in the same way that Beethoven had done but with a much more modern piano that evolved year after year. Between 1840 and 1847, Liszt decided to tour concerts in Europe. In addition, in 1840 he invented the piano recital as it is known today, and he also began to vaguely develop his facet as conductor. After 1842, the "Lisztomania" traveled all over Europe. The reception that Liszt obtained as a result was close to collective hysteria. It helped to foster this environment the magnetic personality of the artist and his presence on stage. After having failed his first marriage, in February of 1847, Liszt acted in Kiev. There he met Princess Carolyne zu Sayn-Wittgenstein, who stayed with him for most of the rest of his life. She convinced him to concentrate on composition, which meant giving up his career as a virtuoso traveler. Subsequently, he spent his life together with the pricesa making some trips. The 1860s was a period of great catastrophes in the composer's private life. On December 13, 1859, his son Daniel died and on September 11, 1862, his daughter Blandina also died. In the 1860s and 1870s, Liszt spent most of his time composing choral works and giving free classes to a very select group of musicians. Liszt was invited back to Weimar in 1869, to give master piano lessons. Two years later, he was asked to do the same in Budapest at the Music Academy. From then until the end of his life, he made regular trips between Rome, Weimar and Budapest, continuing what he called his "trifurquée vie" or triple life. On July 2, 1881, Liszt fell down the stairs of the hotel where he was staying in Weimar. The accident, which immobilized him for eight weeks, changed his condition. A series of complaints manifested: asthma, a cataract in the left eye and chronic heart disease, which ultimately contributed to the death of Liszt. Little by little, his state of mind waned and feelings of desolation, despair and death invaded him. After the death of his father, Liszt returned to Paris and, for the next five years, lived with his mother in a small apartment. He gave up traveling and, to earn money, began to teach piano and composition, often from early morning to late night.He fell ill and suffered a long period of religious doubt and pessimism. He tried to join the Catholic Church, but his mother prevented it. He had many discussions with Félicité Robert, his spiritual father.